Everyone loves mac n cheese. I even know a few lactose sensitive people who put aside their digestive discomfort once in a while just so they can scarf down an ooey gooey dish of the good stuff. 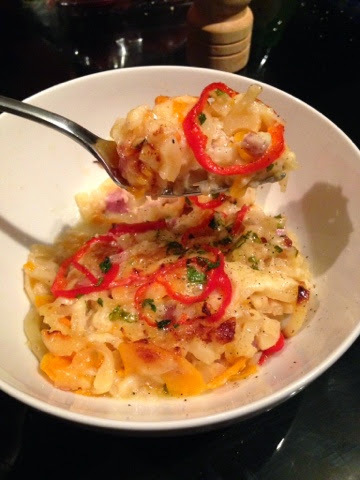 It's such a popular dish that there are now restaurants worldwide that are fully dedicated to serving up mac and cheese in all flavors and varieties (When Mac Met Cheese in London and S'MAC and MacBar in NYC are my faves!). I've posted a couple of my own recipes previously but now with my new handy dandy spiralizer, I've got another great one to add to my repertoire. My original experiment included parsnip which looked great and tasted ok but I found the flavor of the parsnip to be a tad too overwhelming and I want the flavors of the 3 cheese to be the stars so I've changed it to just butternut squash. 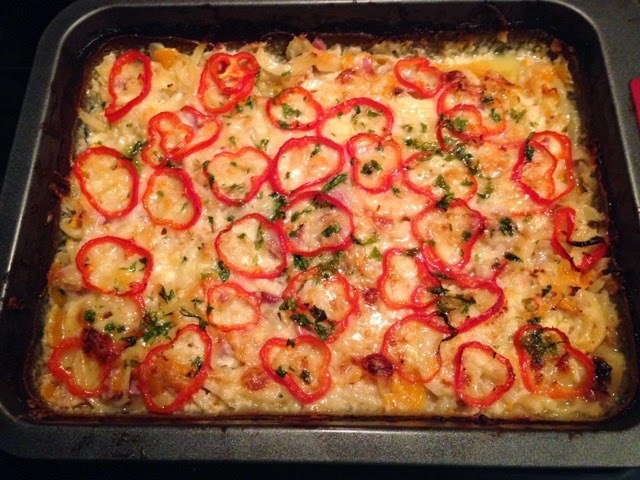 This is a gluten free recipe so everyone can enjoy! And don't forget you can improve and have fun with it by mixing in any ingredient before baking. I tried diced ham which was fantastic but broccoli, kale, bacon or anything you love make great additions. If you don't have a spiralizer you can still do this recipe, you'll just have to peel and slice thin little peices of the butternut squash. Spirlized parsnip and butternut squash is pictured here but I've changed the recipe to just butternut squash as the parsnip flavor was too overwhelming. Heat oven to 350f or 175c. 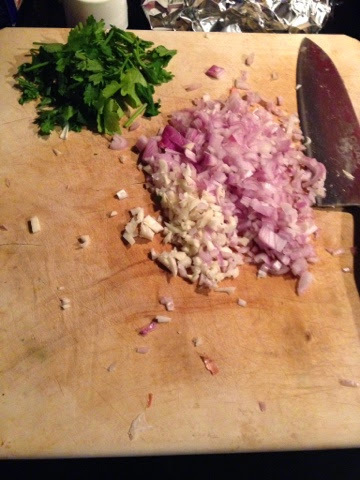 In a saucepan, heat olive oil and sauté shallots and garlic till lightly browned. Stir in the milk then whisk in the corn starch leaving no clumps, turn heat down to medium. Keep stirring making sure to scrape the bottom of the pan so burning doesn't occur and once milk is hot add the cream cheese and stir till dissolved. Turn heat to low. Now, start slowly stirring in the cheese one handful at a time. Once all cheese has been added and is melted successfully, add salt and pepper to your liking. 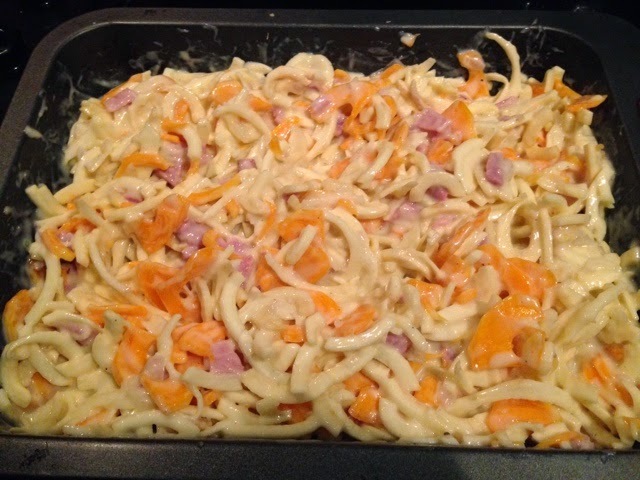 Pour this cheese mixture over the butternut squash "macaroni" in a large baking dish and toss till well coated. Make any of you own additions is desired at this time. 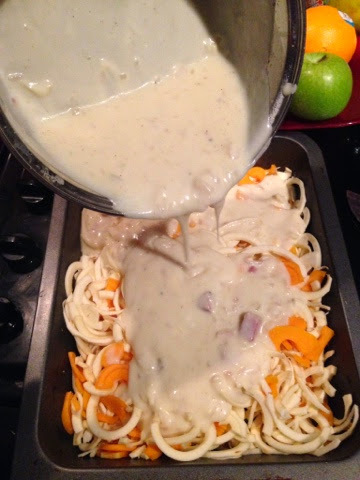 Place in the middle rack of the oven and bake for 30 minutes, stirring occasionally. Turn heat up to 400f or 190c. Sprinkle the 2 cups of the cheeses and peppers evenly over the top, garnish with parsley and continue to bake for 5-8 more minutes or till desired melt/browning is achieved. Remove and let stand for 5 minutes before serving. Dig in!